This A6 Folio Insert (Flat Card) is made from our premium matte 250gsm card stock in a shade described as a very dark navy blue. 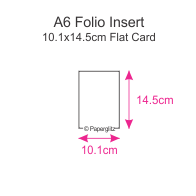 The A6 Folio Insert (Flat Card) measures 10.1x14.5cm. This A6 Folio Insert (Flat Card) is made from paper that is manufactured by Arjowiggins Creative Papers in the UK and is converted and packaged by Paperglitz in Sydney, Australia. This is a premium range of papers that has for many years been a favourite for all wedding stationers. Buy with confidence and specify only "Genuine Paperglitz A6 Folio Inserts (Flat Cards)" for your next project.